Just for fun, we compare Microsoft's brand-new desktop PCs to similarly spec'ed iMacs released a year ago—and the iMacs are $700 to $1,000 cheaper. 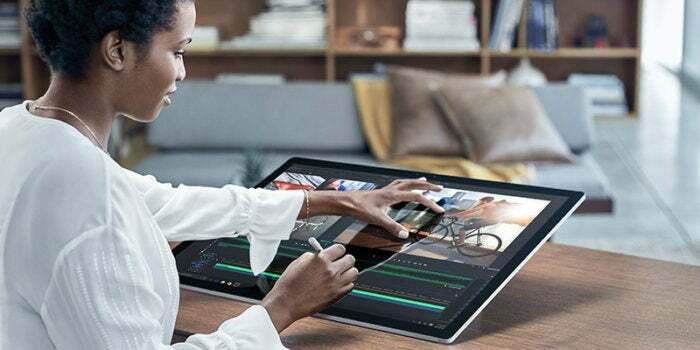 Microsoft announced huge updates to its Surface line of tablets on Wednesday, as well as a brand-new Surface Studio, an all-in-one Windows 10 workstation that takes aim at the iMac. 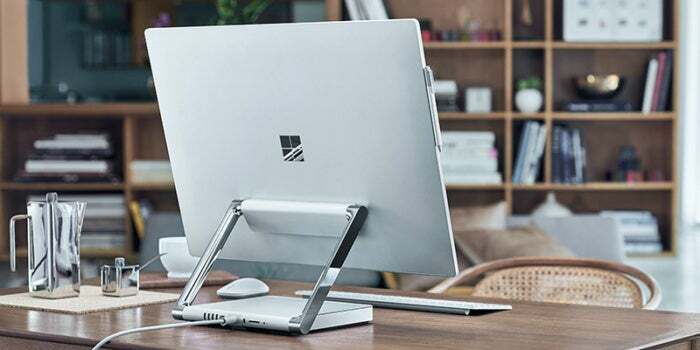 Microsoft’s first desktop PC has a 28-inch touchscreen display that you can stand upright and control with a mouse and keyboard, or tilt toward you to use with the Surface Pen or your fingers, directly on the screen. 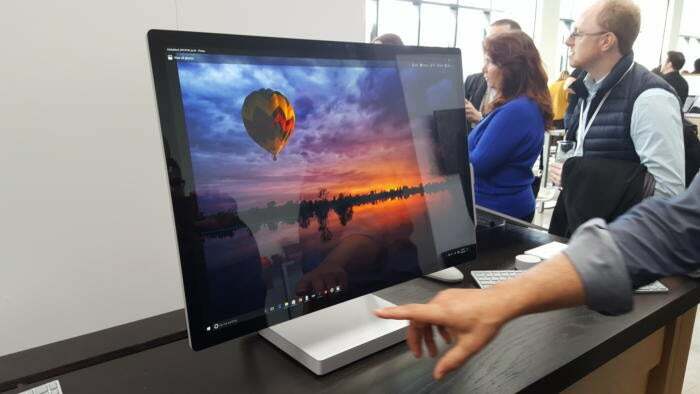 While just this morning I was making fun of the idea of a touchscreen Mac, the first images of the Surface Studio have me eating my words a little bit. The hinge, which Microsoft calls the “Zero Gravity Hinge,” lets the display tilt toward you all the way to a 20-degree angle, kind of like a drafter’s table—and very similar to the angle I get when I prop a 12.9-inch iPad Pro on the Twelve South ParcSlope stand. It’s a comfortable way to work. The hinge lets you tilt the Surface Studio toward you, so you can use work directly on the touchscreen like it’s the world’s largest iPad Pro. Unlike the Surface Pro tablets and Surface Book, the Surface Studio is meant to live on a desktop—the 28-inch, 4500x3000 screen isn’t portable in the slightest, it’s permanently attached to the stand, and it weighs 20 pounds. It’s an iMac—but it’s new and cool. Apple’s iMac line hasn’t gotten a refresh since October 2015, and its other desktop Mac, the Mac Pro, has languished since December 2013. At least Microsoft is pushing out innovative desktop designs—with decent specs to boot—until Apple finally ships new Macs. Thursday’s Mac event is expected to feature an overhauled MacBook Pro design, and perhaps new iMacs too, although those might not be ready just yet. As we wait for new iMac models, we thought we’d compare the high-end Surface Studio to the best iMacs you can buy today. The Surface Studio isn’t cheap by any stretch of the imagination, but what premium will you pay for its clever mix of power and flexibility? The cheapest Surface Studio, which ships December 15, is priced at $2,999. For that, you get a quad-core Intel Core i5, 1TB of storage, 8GB of RAM, and a 2GB GPU. Now, that’s a 6th-generation Core i5, which is the Skylake chipset, not the newer Kaby Lake chipset, since quad-core Kaby Lake chips won’t be available until early 2017. The storage is a “rapid hybrid drive,” which is the same as a Fusion Drive in an iMac, combining solid-state and spinning-platter drives into one volume. There’s no all-SSD option for the Surface Studio. The graphic processor in the Surface Studio is an Nvidia GeForce GTX 965M, with 2GB GDDR5 memory. (Higher-end Studio models use the 980M with 4GB GDDR5 memory.) That’s a notebook-size GPU tuned for gaming, but the Surface Studio is aimed at creative pros—the 192ppi screen supports the sRGB and DCI-P3 color profiles, and you can switch between them with a single button-press. The Surface Studio comes with the Surface Pen, plus a matching keyboard and mouse. Apple’s 27-inch iMacs also have quad-core Intel Core i5 processors, the same Skylake chipsets as the Surface Studio. But a similarly spec’ed 27-inch iMac would save you a thousand dollars. 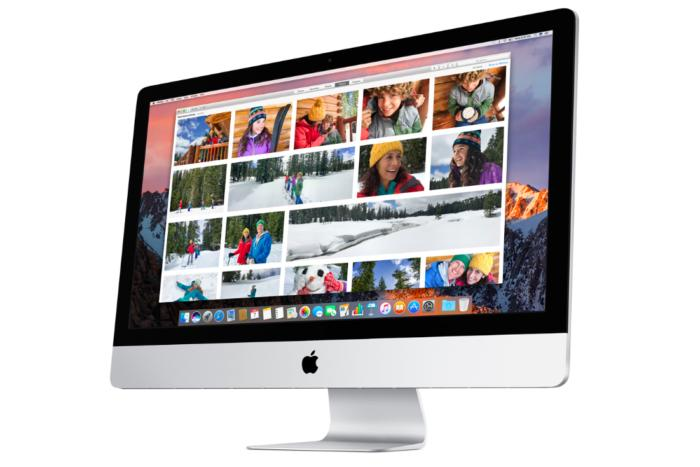 For $1,999 you could order Apple’s midrange iMac straight off the shelf, and get a 3.2GHz quad-core Intel Core i5, 8GB of RAM, a 1TB Fusion Drive, and a 5120x2880 “Retina 5K” display with P3 color profile. The biggest difference is the graphics chip—in the iMac, you get an AMD Radeon R9 M390 with 2GB of GDDR5 memory. There is no Nvidia option for this iMac; it’s AMD all the way. Intel offers a middle tier of Surface Studio with double the RAM (16GB) and an Intel Core i7 in place of the Core i5, for an extra $500, or $3,499 total. But let’s push the limit and max out every Surface Studio spec just for fun. The best Surface Studio you can order is $4,199. It’s got the Intel Core i7 processor, a whopping 32GB of RAM, a 2TB hybrid drive (again, the same thing as a Fusion drive on a Mac), and an Nvidia GeForce GTX 980M GPU with 4GB of GDDR5 memory. Apple’s iMac hasn’t gotten a fresh new design overhaul, but you can get one with very similar specs as the Surface Studio for hundreds less. A 27-inch 5K iMac with similar specs is still $700 cheaper, at $3,399, which includes some build-to-order options needed to match what the Surface Studio is offering. Going to a Core i7 processor, for example, is a $250 add-on over the $2,299 model, and getting up to 32GB of RAM will set you back an additional $600. The final upcharge would be $250 for the best GPU, an AMD Radeon R9 M395X with 4GB of GDDR5 memory. But you could keep pushing the iMac past the Surface Studio with a few more options. Microsoft’s all-in-one tops out at 2TB of storage, for example, but the iMac can have a 3TB Fusion Drive for an extra $100. If you want super-speedy all-flash storage, that’s also doable, with a max of 1TB for $700. A fully maxed out 27-inch iMac would cost $4,099 if you ordered it today, with the same Core i7, 32GB of RAM, and 4GB of graphics memory as you’d get it in the top-of-the-line Surface Studio. The iMac would have 1TB of faster solid-state storage, compared to the 2TB hybrid drive in the Surface Studio, and the Microsoft machine has an Nvidia GPU to the iMac’s AMD. The Surface Studio looks pretty neat, I must admit—it’s more adjustable, and comes with the Surface Pen, which is $60 on its own. But with the Mac, you get macOS Sierra. The Surface Studio runs Windows 10. So is it really much of a choice after all?